What was the mission of Jesus? As many scholars have pointed out, Jesus seemed acutely aware that his people were on a lethal collision course with Rome. If Israel did not repent, if Israel did not listen, she was going to revisit the catastrophe when the Babylonians destroyed Jerusalem and the Temple. It was all going to happen again, Jesus prophesied. History was repeating itself. 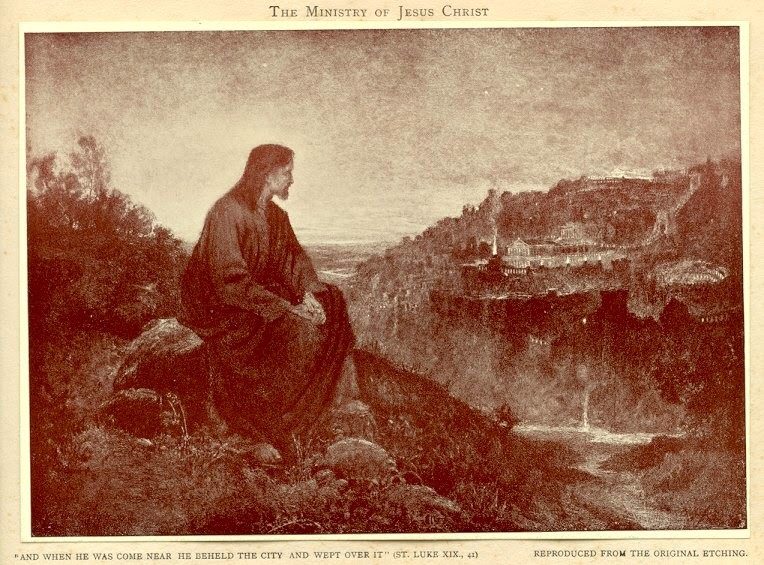 Specifically, why did Jesus weep over Jerusalem? It was because Jerusalem had failed to learn "the things that make for peace." And because Jerusalem had failed to respond to Jesus's kingdom proclamation, failed to learn the things that make for peace, that the kingdom of God was "in their midst" if they had the eyes to see it, Jerusalem had set herself on a path of destruction. What I find important in these observations is how Jesus's teachings regarding salvation and judgment are rooted in the concrete and historical conflict between Jerusalem and Rome. Jesus's kingdom proclamation wasn't about a heaven in the clouds. The kingdom was about learning "the things that make for peace" in this world. Learning that the kingdom of God is, right now, "in our midst." The kingdom is here, but it's the treasure hidden in the field. It's the seed being sown. Will that seed--the kingdom proclamation--find good soil in our hearts? Will we learn the things that make for peace? Moreover, let's note that the judgment Jesus spoke of--that place of weeping and the gnashing of teeth--wasn't hell. This was the judgment that Jesus wept over: violent death in this world. The "coming judgment" was a personal and communal annihilation because a people had failed to learn "the things that make for peace." With Jesus we continue to weep over a world that refuses to learn "the things that make for peace." Interpersonally, socially, economically, politically, ecologically. We continue to proclaim Jesus's message, that the kingdom of God is in our midst, so that the world might be saved from self-destruction. "The things that make for peace" are not learned because in the outlook of too many peace is boring. Violence and war are more exciting. Peace is boring because there is no passion, no compassion, for the people around us, beyond us; they are not looked upon as living, feeling, loving beings as ourselves; we feel autonomous, yet bored. So we fall into hell's trap for violence and war...excitement. It is a new birth like no other when violence and tragedy intrude into our lives and cause us to see others in ways that we never thought possible. I remember when Saddam Hussein's sons were killed in battle. As evil as he and his sons were, and though I had no idea how he felt when he learned his sons were dead, there was a part of me, a large emotional part of me, that felt sad for him. I know there are those who do not understand that; but I am sure that are some who do. When you are awakened in the middle of the night and told your child is dead, the greater part of you never looks at life and death the same way again. In war, people's children are sent in to finish what adults have failed to accomplish. And whether the parents are us, or of the enemy, if we fail to take a moment to imagine their loss and pain, then we will eventually be destroyed, our very souls always first, by our boredom with peace. Having been trained in our culture, if you will, in "violent communication" by way of being a child in a nation at war, playing competitive sports in school, training as a policeman in Dallas in the mid 60s and then as a fighter pilot in the Navy I have sensed a profound yearning for a different type of training. In all those violent employments I never "literally" took a human life though I have "hated" in my heart and thus am guilty of murder. I, currently, am studying Marshall Rosenberg's nonviolent communication to change my perspective. Already I am learning a new vocabulary, how to receive empathically, how to observe without evaluating and many other helpful concepts. It helps to have a wonderful and patient wife who supports me as I stumble along. Your point today is well taken. Thank you so much for your thoughtful blog to assist us on the Way. Grace & peace. This is great stuff. Thank you, Richard. I read your blog daily, as do many other friends in my circle. I would love to see a post regarding Jesus, the Kingdom, and how it pertains to the current ISIS situation in Syria/Iraq. Now that the US is "officially" involved (bombings last night), its even more relevant. I read today they are crucifying people in Raqqa, Syria. These kind things make Jesus even more real for us, and our faith increasingly relevant (or irrelevant). I don't think I have anything particularly insightful to say. Regarding the acute theopolitical question--Should the US bomb ISIS?--the answers from, say, the Christian realist/Constantinian vs. pacifist/Ana-baptist perspectives are pretty well-rehursed. But regarding the macro-level issues concerning the toxic mix of Empire and religious zealotry over generations in the Middle East I think Jesus's diagnosis--about how we've failed to learn the things that make for peace--is both accurate and prescient. "We continue to proclaim Jesus's message, that the kingdom of God is in our midst, so that the world might be saved from self-destruction." Actually, we still are not proclaiming Jesus's message when we continue to insert into the Bible, teachings that Jesus never taught, both in Epistles and Revelations. Both some Epistles and Revelations are full of derogatory proclamations against women and those of a different sexuality identity and orientation. It compounds the problem of communal "self-destruction" when we deliberately close out the voice and wisdom of others, particularly the vital intelligence of entire gender, but also those we presume to be sinful in their sexuality even when we can observe the tremendous love and devotion to love in the lives they live, all because some Epistle or the book of Revelation, rather than Christ himself, said so. We still don't have Christianity. It is no wonder at all that in 2, 014 the path of "self-destruction" of our entire human civilization just continues to devolve rather than evolve into higher levels of consciousness. In fact, haven't we all waiting for the "great destroyers and destroyer" foretold in Revelations, supposedly doled out vengeance by God's angels because "God" said "His" wrath would be so great against all humanity and all of life on planet earth? How much more violence can we manifest than what Revelations trumps up for all of life? We are building hell of heaven by what we teach, and especially what we teach in the name of Christ. We are choosing to believe and propagate lies rather than simple seek the joy and abundance of Christ's real message, that "the reign of God in our midst." The image of man might be the image of God, but neither humanity or God is only male.